Modern wheel service technology is rapidly changing the face of auto shops. The wheel balancers that were brand new a few years ago are still excellent pieces of equipment, but there's always something faster, better and more reliable around the corner. Right now, laser wheel balancers are all the rage, and for good reason. They save techs time and improve placement accuracy by literally taking the guesswork out of every single step in the balancing process. Here's why you should get a laser wheel balancer for your shop. Anything that has a "laser" certainly sounds futuristic and techy, but the technology is extremely easy to use. A laser is really just a focused beam of light. When a laser is incorporated into a wheel balancer, the light pinpoints the location of the next weight placement. A laser wheel balancer is simply a new way to utilize very simple, very basic laser technology. Every minute counts. The more customers you can get in and out of your doors, the more profit you earn. While other wheel balancers take only six or seven seconds to register imbalances, the LS43B laser wheel balancer actually shows you where to put the weights. The balancer stops top-dead-center, and a little light beam points at the wheel. It's virtually impossible to mess up the weight placement, so techs will enjoy faster turnaround and more business overall. The more accurate the wheel weight placement, the longer the wheel will stay balanced. Imbalances can lead to a host of problems, from vibrating steering wheels to permanent suspension damage. Customers will see that you offer the highest quality service because Ranger's Laser-Spot™ technology ensures a perfect weight placement. Furthermore, a laser wheel balancer will help techs use fewer weights, which saves the shop money. If the amount of weight used is too high or too low, more weight will need to be added in order to balance the tire and wheel assembly. Weights are rarely removed, because that's even more time-consuming. Every wasted weight is money down the drain, and laser technology is one of the fastest ways to eliminate the concern. We've been the world leader in automotive service solutions for decades, and for us, the addition of a laser wheel balancer is just common sense. At Ranger, we pride ourselves on being able to deliver exactly what you need without any tacky bells or whistles. This wheel balancer is meant to work ​hard, and we hope you put it to the test. Time-saving laser technology is ideal for fast-paced tire shops and full-service repair bays that need the best equipment on the market. Ranger's Laser-Spot balancer delivers on that promise, and then some. Lasers aren't science fiction, and they aren't dangerous. 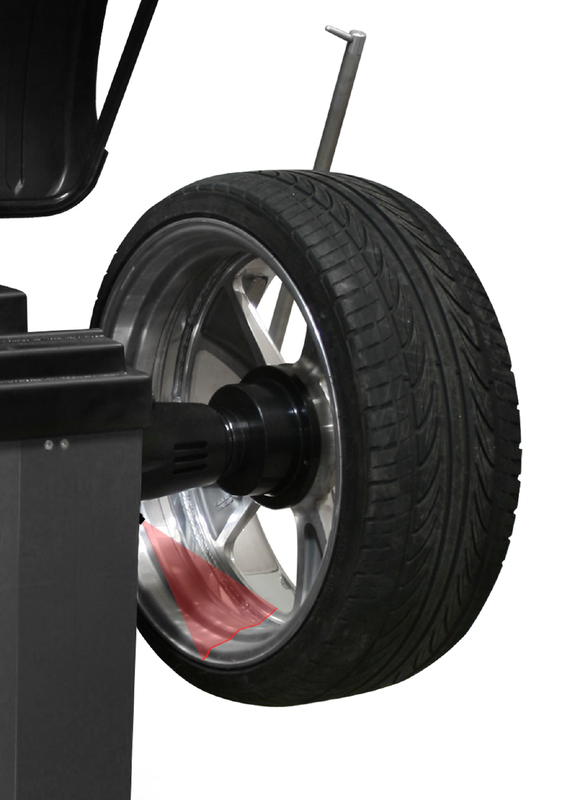 With a laser wheel balancer, your balancing procedures will be faster and more accurate. They'll also use fewer weights to achieve a perfect wheel balance. If you need new wheel service equipment, make Ranger your first stop, and explore how we can help your business earn more profit.